Dumont d'Urville : Voyage of the Astrolabe and Zelle, 1837. The first French ship named Astrolabe was a converted flûte built in 1781 at Le Havre, originally named the Autruch. The name derives from an early navigational instrument, a precursor to the sextant. In 1785, the Boussole (previously the Portefaix) commanded by comte de Lapérouse and the Astrolabe under Fleuriot de Langle departed for a round-the-world voyage of scientific exploration. The two ships were last reported sheltering in Botany Bay in 1788, while Arthur Phillip was establishing the English penal settlement at Port Jackson, before they disappeared in the Pacific. The second Astrolabe was a horse barge, first named La Coquille, and converted to an exploration ship of the French Navy. 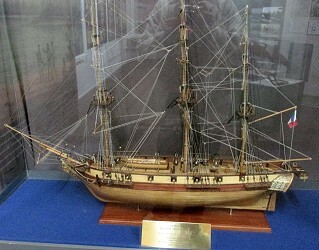 As La Coquille and commanded by Louis Isidore Duperrey, with Jules Dumont d'Urville as second, she circumnavigated the globe in 1822–1825, visiting the Falkland Islands, Chile, Peru, New Zealand, New Guinea, Australia, and the archipelagos of the Pacific. Following the success of this expedition, the renamed Astrolabe under the command of Dumont d'Urville departed Toulon in April 1826 on another voyage. 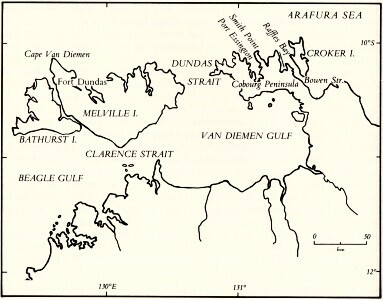 Apart from collecting navigational and scientific information, the objectives of the mission included assessing the viability of south-west Australia as a possible French colony and establishing the fate of the Lapérouse expedition. In 1826, the Astrolabe, sailed up the south east coast of Australia, anchoring for several days inside Jervis Bay, and recording an early and detailed account of the bay and local Aboriginals. Having first examined the south-west coast of Australia and passing through Bass Strait, in late November the Astrolabe was off Wilson's Promontory and sailing north. See: Dumont d'Urville: Voyage of the Astrolabe, 1826. Dumont d'Urville's third and final voyage to the Pacific was with the Astrolabe and the Zélée, captained by Charles Jacquinot, from 1837 to 1840. France’s last and greatest scientific voyage of discovery by sail, Dumont d’Urville was promoted to rear-admiral on his return. Tragically, he had completed only three volumes of the official account of the voyage, when d'Urville, his wife and son, were killed in a railway accident at Bellevue on 8 May 1842. 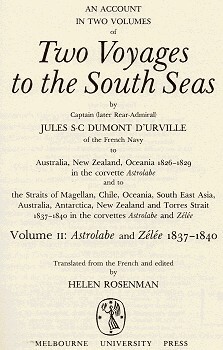 The remaining volumes of Voyage au Pôle Sud et dans l’Oceanie (Voyage to the South Pole and Oceania) were completed by other members of the expedition. observatory island from the mainland, and making for the spot where M. Dumoulin had set up his tent. Judging from the canoe that brought our visitors, their industry is still in its infancy; a few pieces of bark clumsily cobbled and held together by two sticks are all that constitute this craft, and if, being light, it can be easily carried, it does not permit these savages to venture far from the shore and out to sea, however calm. In a country like New Holland, where you do not find any of the fruit trees or food plants that grow wild in tropical lands and sustain their many inhabitants, life must be difficult for the Australians; these unfortunate people must turn to the coasts, for it is there that they most easily find food. Some shells we saw in their hands provided us with an opening to ask them questions, and we soon learned from them that in the arm of the sea separating the observatory island from the mainland, there was a huge bank of these shellfish and that the shallowness of the water covering it makes fishing very easy. And that was the only information we could get from them. M. Dumoulin informs me that the natives have crossed from the mainland to Observatory Island without their boat, the water was only up to their waists; on their way they gathered some cockles which they then happily handed over for a slab of ship's biscuit. These shellfish, which I ate, are delicious; this is a valuable discovery that we can exploit ur stay here . Often during my rambles I had noticed in several places little semicircular walls built of dry stones joined side by side to one another. I had racked my brains to make out what these little structures could be for, when the Malay fishermen arrived. Their boats were scarcely anchored before they quickly brought on to the island several big boilers of cast metal, hemispherical in shape and about a metre in diameter. They placed them over the little stone walls I spoke of which were used as fireplaces. Near these improvised stoves they erected open bamboo sheds composed of four strong stakes stuck into the ground supporting a roof with covered frames, meant, no doubt, for drying fish when the weather is bad. During their stay in the bay, as the weather was favourable, these fishermen did not use the sheds which, I presume, they had got ready as a precautionary measure. This crowd of men working hard at establishing their plant had given an unusual appearance to that part of the bay that could not be long in attracting several of the mainland savages to this spot. Almost all of them arrived at the little island, either by swim­ming or wading across the narrow stretch of shallow water that separates it from the continent. I only saw one very rough looking canoe that had brought over three of them. When night fell, the Malays had finished all their preparations; some of them remained to guard the stuff they had placed ashore, all the others went back to their boat. For a long time after the departure of the fishermen, the natives still prowled around the boilers and sheds; then they finally assembled, twenty-seven of them, on a sandy beach at the water's edge. A fire was lit, they all lay down on the sand in a circle around the fire, lying on top of one another like cattle in a stable. Among these savages three only were armed with spears which they could hurl quite a distance with great skill. They were quite inoffensive; it was before eight o'clock and they were already peacefully asleep untroubled by the mosquitoes. I had left the troop of savages and I was going back to my tent when I noticed three more praus flying the Dutch flag coming into the bay. Each of these boats is equipped with two rudders (one on each side) which can be raised as required when the boat touches bottom. the deck by means of a hinge. Their anchors are all of wood, for there is little iron in anything of Malayan construction. Their cables are of rattan or gomotou. The crew consists of about thirty-seven men. There are six small craft to each boat. When we were visiting they were all busy fishing and some were moored a short distance away. Seven or eight almost naked men were diving to seach for trepang on the sea bed. The skipper of each small craft alone remained in the boat and did not dive. The blazing sun hurled down its rays on their heads without causing them any discomfort; there is no European who could stand up to such a job for more than a month. It was close to noon, and the Malay captain told us this was the best time to fish for trepang. And, in fact, we could see each of the divers coming back to the surface every time holding at least one and sometimes two fish in each hand. It appears that the higher the sun is in the sky, the more easily they can see and catch their quarry. The divers only just appeared on the surface to throw into the boat the fish they caught before immediately diving again. When these small boats had a big enough load they were replaced by empty boats and taken to the beach on the island. I followed one of them to watch the cooking of the trepang it was carrying. The trepang or holothurian of Raffles Bay is almost five to six inches long with a diameter of two inches. It is a fat fleshy mass, cylindrical in form and it is hard to distinguish any organ on the outside. This mollusc sticks to the sea bed and as it is capable of only very slow movement, the Malays catch it easily. The first requirement of a good fisherman is to be able to dive perfectly and have a trained eye to pick it out on the sea floor. To preserve it, the fishermen throw it alive into a cauldron of boiling sea water, which is constantly stirred with a long wooden pole that they rest on a fork stuck in the ground to act as a lever. The trepang loses the water that it contains and after two minutes or so it is taken out of the boiler. A man using a large knife opens it up to clean out the intestines, then it is thrown back into another boiler where it is again heated in a very small amount of water and wattlebark. In the second boiler a lot of smoke is produced from the burning of the bark. The purpose of the second operation seems to be to smoke the animal to ensure its preservation. Lastly, from there the trepang is placed on frames and left in the sun to dry out. After that it only remains to pack it on board. It was 2 p.m. when the divers stopped their fishing and came ashore. Soon my tent was surrounded by them. Amongst them I recognized the skipper of the prau I had visited in the morning; he came closer and examined minutely all the physics apparatus that was in the observatory and wanted to know its use. A gun I had beside me amazed him, especially when I gave him a demonstration of the superiority of its mechanism to that of a flintlock. He told me these weapons were still unknown in the Celebes where he came from, but I remained unconvinced about that. Then later, as he was questioning me about the places we had already visited and those we intended to go to, I ventured to draw for him on a piece of paper a sketch of the map of New Holland, New Zealand and New Guinea. Then he took the pencil from my hand and added the whole of the Indies archipelago, the coast of China and Japan, not overlooking the Philippines. adding at the same time that he knew the exact position of all those lands, and that he could easily take his boat there. He finished up asking me for a glass of arrack. I do not know if this worthy Malay professes the Muslim religion, but what I do know is that he drank half a bottle of wine and half a litre of arrack without any apparent ill effects at all. He then offered me some prepared trepang, urging me to taste it. I found that this fish when processed had a taste very like lobster; my men thought it was very good and gratefully accepted the captain's gift. As for myself I felt an insurmountable repugnance to even tasting it. Trepang is sold in the Chinese markets; according to the information our Malay skipper was able to give us, the price of the foodstuff would be between fifteen rupees (about thirty-two francs) a pikul of 125 pounds. He estimated his cargo as worth about 3000 francs; three months is enough to get it. Since time immemorial Malay fishermen have exclusively exploited this trade, and it will always be difficult for Europeans to set up any competition to them because of the economy the Malays can apply to the equipping of their boats, thanks to the excessive sobriety of these men who are both intelligent and energetic. It was nearly 4 p.m. when the Malays finished their operations. In less than half an hour they had stowed their harvest on board, the sheds were taken down and, with the boilers, put on to the boats which were preparing to set sail. At 8 p.m. they had hoisted their sails and were on their way out of the bay. Later on, at the very moment we least expected it, two kangaroos did bound out about ten yards from us: they made prodigious leaps, and each time they came down they struck the ground with great blows of their strong tails to propel them upwards again; we fired, but they were already out of range. hundred yards further on we found a savage with a little bark canoe: he had a basket on his back, I dropped a note in it and pointed to Astrolabe; this chap understood me with an intelligence I never would have expected. He paddled out to Astrolabe, handed my note to the first sailor he saw on deck and soon they came to fetch us. We were parched; we had walked for twelve hours without finding a drop of drinkable water. In the evening we saw two canoes coming out to the ship carrying eight or ten savages. They are indeed the most miserable race we have seen so far: the poor wretches were half-starved and jabbered the word bread, bread; to make us better understand what they wanted, they slapped their hollow bellies to arouse our pity. The canoes in which they had paddled out to the ship were tree trunks crudely hollowed out, without sails, and for paddles they had only bits of poorly trimmed wood. I left on the 29th [March] in the morning to explore the Bowen Strait. The work had taken longer than I expected: eighteen miles of channel to sound and forty miles of coastline to chart in three days left me little time to waste. We had lit our camp-fires on the beach. 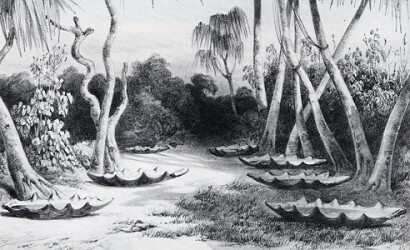 While poking about around our bivouac, the sailors found two roughly-made bark canoes with room for two people at the most, even in calm weather; we left them alone, assuming they were the property of natives probably living in the interior of the island. Our friends from the morning had not lost sight of us, for a canoe like the ones we had found on the beach was in the centre of the channel, coming from one of the bays we had charted the day before. New Guinea and Torres Strait: the route of Astrolabe and Zellee, 23 May to 12 June 1840. Tudu Island is scarcely a mile in length. The reef surrounding it and exposed at low tide greatly increases its extent from north to south. It is a bank of sand hardly above water level, and from the northern point on which there is a clump of trees, the rest of this very poor soil is saline, marshy and covered with grass and scrub which give almost no shade. On its southern end continually battered by the sea, there is a small dune where about a dozen huts can be seen. It is on this point, the one that is most exposed to the sun and wind, that the natives have set up camp. On this sandy island there is not a trickle of drinkable water, or coconuts, indeed no vegetable product suitable for use as food. To procure fresh water the natives carefully collect rain water, which is certainly abundant in these regions. To do this they place giant clam shells under the pandanus trees, the leaves of which are broad and hang down towards the ground to catch the water. Some of these shells were very big. When we were there all these reservoirs were almost full, and if, in these areas the rains are always as plentiful as at the time we were there, there is no doubt that they amply provide for the needs of the population. The natives we saw were remarkable for their fairly tall stature and appeared robust; however, they seemed to lead a poverty-stricken life. They had quickly learned the times the crew had their meals; they then flocked aboard our ships to ask for pieces of hard tack that they greedily devoured. Apart from a few shellfish and other fish, they had nothing to offer us in exchange. Fish seemed to be their main source of food; each day we saw their vessels leave the island and make their way north to get the day's meal. Their fishing place was a long distance away. The first time we saw these boats loaded with women and children heading in that direction, we thought they were terror-stricken at our proximity and wanted to get away to avoid any sudden attack. When our officers went to the village they found all the huts deserted; they had purposely removed their women and children to protect them from being pursued by Europeans. We noticed there spears tipped with iron points and some axes. In all probability these men have frequent contact with English ships. they were armed with bows and arrows which they certainly had not been able to get on their own little island. These weapons very much resembled those of the Papuans and I am sure they came from New Guinea. The natives of Tudu Island go round stark naked; their skin is black; their hair is frizzy; their build slight; they are healthier than the Australian natives and seem also to be more industrious and enterprising. They do a raised tattooing that lines their shoulders with fleshy pads arranged like the fringes of epaulettes. They seemed to us to be gentle and shy and affectionate, but we might have found them tough and fierce if a smaller number had fallen into their hands. Our weapons frightened them quite a bit, and the trouble they had gone to to hide their womenfolk is sufficient indication of the extent to which our proximity alarmed them. Beside the village we saw about thirty canoes on the shore. One of them was more than ten metres long. It was hollowed out of a single tree trunk, obviously not from their island and probably from New Guinea. All these canoes were decorated with crude carvings, the prow of one of them represented an old man with a long beard of seaweed. We also noticed tombs, over which were heaped pyramids of skulls and bones of dugong. It appears that the coral reefs of Torres Strait are the true home of this seal species, of which the expedition already had a specimen, thanks to the kindness of M. Stuers the Governor-General of the Moluccas. We do not know whether the natives ate the flesh of these animals, but what is certain is that they caught a lot of them, for, on the northern part of the island we saw a huge quantity of their remains, forming ossuaries intended as decoration for the sepulchres; using the ribs of these animals they had been able to construct walls one to one and a half metres high by nearly two metres thick. The skulls were piled up sometimes into a pyramid; sometimes they were suspended from the surrounding trees with very big shells. M. Dumoulin, as in Monsieur Dumoulin, and used for all the officers, MM for plural. Dumont D'Urville: Voyage au Pôle Sud et dans l’Oceanie (Voyage to the South Pole and Oceania), Gide, Paris 1846-1855. The astrolabe - navigational instrument. Geoff Cater (2014) : Dumont d'Urville : Voyage of the Astrolabe and Zellee, 1837.